“Although wars and environmental crises are taking place in many parts of the world, through love and compassion, people from different religions and regions can bring peace to our world, increase stability in our society, enhance harmony in our family, and create happiness in our mind. This is everyone’s responsibility. 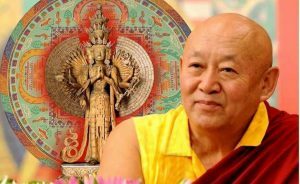 It is very important that we try our best to cultivate love and compassion and pray sincerely.” HH Drikung Kyabgon Chetsang Rinpoche. 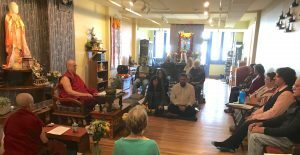 We have an inner and outer responsibility as Dharma practitioners and bodhisattvas in training. We use the Dharma to see where our own ignorance begins. Then we can work together to lift confusion wherever we find it. Khenmo is offering training in sensing subtle perception to see bias and expanding loving kindness to overcome it. 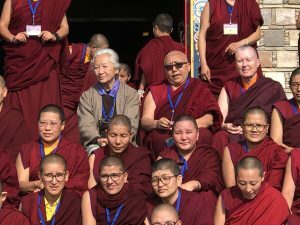 Khenmo Drolma and Acharya Yeshe have had a very active winter! Our activities with local and international Sanghas range from showing up to support the Portland Muslim community for their safe worship the first Friday after the shooting in Christ Church, creating a program for the Portland Police, presenting HH Drikung Chetsang’s Shravasti curricula at the Three Rivers Dharma Center in Pittsburg and at Urban Dharma Center in Charlotte, a residency for Acharya at the Milarepa Buddhist Center in Iowa, to the very successful Tibetan and Himalayan Nuns Leadership Conference in India!